…flashbacks of writing OSNews version 3’s HTML!! Oh, don’t talk too much about v2 or v3. They worked PERFECTLY on every browser. This is what code is supposed to do: WORK. This is not about the end result, it’s about the coding itself. And either way, it’s a JOKE Eugenia. Just laugh and don’t put so much effort into it. Well, what Adam said is not exactly in line with what the comic portrays. HTML is not a language, so it’s not about being “good”, it’s about actually being “compatible”. Hmmm. I wonder what the ‘L‘ in HTML stands for then. Well, you’re both at least partially wrong in what you imply: HTML stands for “Hyper Text Markup Language” and that’s exactly what it does: it describes how things should look, but… it has zero program logic that can be expressed in and of itself; therefore, you can’t write anything algorithmic in any way, shape or form, and can’t do serious work with it where computation is required, at least not without going into a deep WTFery state of abusing an HTML-capable browser. HTML simply isn’t a programming language, and it is not remotely Turing-complete. I certainly don’t believe that the HTML exposed by OSNews is entirely static either. Clearly some programming had to go into the backend server in order to GENERATE the HTML. Perhaps it was even intelligent enough to figure out what browser was requesting it – and thus altered the HTML on-the-fly. So, while HTML maybe is not “programming language” in itself, it certainly requires programming to generate HTML of the complexity displayed here on OSNews. Regardless it is still a language, a declarative one. No-one made conditions about it having to be Turing-complete. HTML is not a language, so it’s not about being "good", it’s about actually being "compatible". As it has been pointd out before, the L in HTML stands for Language. So it is one. But HTML is not a programming language. HTML’s quality is about compatibility and standard complicance. This is what code is supposed to do: WORK. By the same measurement Trabant was a good car since it could transport people between point A and B. It didn’t do it safely or well but it did it. Not saying OSnews v2 and v3 was like Trabant (I liked both v2 and v3), only that “it works” isn’t a good measurement of quality. Watched a leg of The Amazing Race with these cars. If I remember right 6 teams, 6 cars. One car blew out it’s engine. One car had a flaky transmission and problems with the turn signals. This is just in one single leg of the race and it had a 50% failure rate. That is one piece of junk of a car. By the same measurement Trabant was a good car since it could transport people between point A and B. It didn’t do it safely or well but it did it. Hey, don’t complain about the Trabant, you could repair it with rubber tape and glue! 🙂 The Traband was a very service friendly vehicle, not comparable with today’s electronically controlled blackboxes. In regards of comfort or security, the Traband could not impress, but it had other strengths. In a country that was low on ressources (GDR), the Trabant was a way to bring “luxury” to the masses. You cannot compare with today where an own car is nothing special, expensive or time consuming (you had to wait several years for your Trabant, as well as for a phone). The same way the GDR built cars, it built computers. Reliable and robust, but heavy and expensive. It’s the same way we talk about tools: There is not “the” tool for everything. You have to decide well which tool is the best one for you to accomplish a certain task. The same is true for cars. And for (programming) languages. Not saying OSnews v2 and v3 was like Trabant (I liked both v2 and v3), only that "it works" isn’t a good measurement of quality. This is true. Quality is not all about working, it’s about style and paradigmata, too. 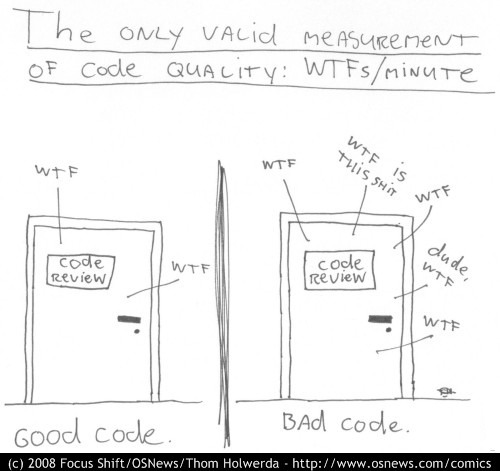 Is the code readable? Does it run reliable in every setting it is intended to? It is documented well and understandable? Does it check for errors, how does it handle them? In most cases, “just works” code is of low quality in these regards. The “just works” solutions are usually the ones that prevail, and it’s obvious: Why would you want to change (improve) something that’s already doing what it is expected to do? I liked v3 very much, but v4 now (!) works for me, too. Exactly, I like v3 a lot better than v4.x. I find this to be your funiest comic for now! My predictions that the comics will get better are proving to be true! Hah, I am all-knowing! This should get the comic of the year award. Very well put. Awesome. This is the first cartoon here that has really made me laugh. Now it is back to the Print Kit of Haiku again….. Thanks for the compliment – I can say honestly that I won’t be able to make ‘hits’ like this one every time – but I’ll try. This one made me laugh out loud. Good work!